In an online poll survey conducted by Agri Nation, 68 percent said that there was no improvement in farmers’ condition in the last four years while only 32 percent said that there was an improvement in farmers’ condition. Over 900 people casted their votes. 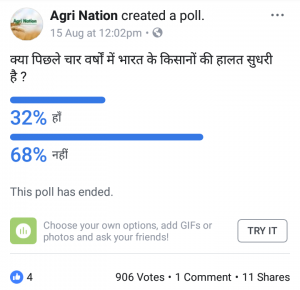 The poll was conducted amidst the accusation that the Modi government has been an anti-farmer one so far. Though the government has announced several schemes in the farm sector but none seem to have worked so far as the discontent among farmers has been widely visible over the period of last four years. Government has been facing farmers’ agitation all over India over the issues of increasing farmer suicides due to burden of loans and crop failure, crop insurance, dwindling farmers’ income, MSP (Minimum Support Price), assured income commission for farmers and for farm loan waivers. From farmers walking barefoot to Mumbai to farmers going on holiday for 10 days, farmers all over India have protested in different ways in different places. Tamil Nadu farmers protested in Delhi with skulls of dead farmers who committed suicides. Farmers organized their own parliament and passed their own agri budgets. Jai Kisan Andolan also launched a ‘MSP Satyagrah’ to ensure that farmers across the country get the minimum support price (MSP) for their agricultural produce. Though Modi Govt was compelled to announce a MSP with 50 percent increase but it remained controversial as it was not the same as MSP as calculated by C2 formula. Over the issue of farm loan waiver, Modi government, in the recently concluded monsoon session told in Parliament that it was not going to offer any farm loan waiver as it may incentivise the defaulters and discourage the borrowers who have been repaying their loans. It may also be noted that the farm loan waiver schemes announced by various state governments have come under scanner as there have been news of farmers getting waiver of just Re 1 in thousands of cases. Government has been reiterating that it will double the farmers income by 2022 but it has failed to reveal what the minimum income would be.